The librarians of the Federal Reserve Bank of St. Louis have been busy. 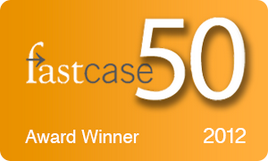 Independently, and working with their colleagues in the Bank’s Research Division, they have helped to make the Bank’s website an information hub. Since this column is called “The Government Domain,” there is one important point to make before going forward: The St. Louis Fed is not a really government entity. The Federal Reserve Board of Governors in Washington, DC, is part of the U.S. government; the twelve regional Federal Reserve District Banks are not, but they do have unique federal roles and responsibilities. All is explained in the classic The Federal Reserve System: Purposes and Functions and in the Fed’s FAQs. The St. Louis Bank, which serves the Eighth Federal Reserve District, became known as a center for research data in the 1960’s under Research Director Homer Jones. The tradition continues, and today the District’s website is rich in research resources. The Bank’s library staff has been making its own contributions. Each of these categories is further divided into sections for international, national, and regional economic information. Liber8 includes the Liber8 Newsletter, a “selection of useful economic information, articles, data, and websites compiled by the librarians of the Federal Reserve Bank of St. Louis Research Library.” The Liber8 Newsletter was launched in January 2008. It will be issued nine times a year, monthly except for June, July, and December. Issues to date have covered the topics “Big Box Retail and Its Impact on Local Communities,” “The Economic Impact of an Influenza Epidemic in the United States,” and “Baby Boomer Retirement.” The two-page PDF newsletter is available for free, with new issues announced via email or RSS subscription. The newsletter is designed to provide the economic context of issues in the news and to explain the concepts behind the data. One of the valuable resources to which the Liber8 portal leads is the International Economic Statistics (IES) Database, also created by the librarians of the St. Louis Fed. 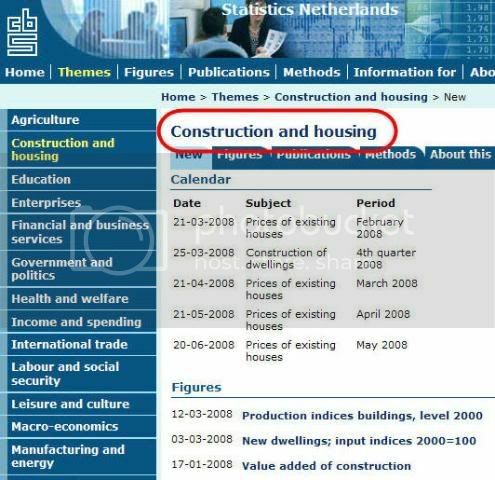 Listed under the international section of the Current Economic Indicators category, IES is a specialized portal for accessing the economic indicators posted on other nations’ official websites. IES is more than just a list of links. Each linked indicator is described in a catalog record that includes “title, corporate author, publisher, years covered in the data series, type of publication (text, table, chart), frequency with which the data is published, country of origin, a URL, available languages, subject headings, format (.pdf, .xls, etc. ), a summary (where available), and any notes needed to clarify the data.” IES users can browse the records by title, corporate author (e.g., Czech Statistical Office), subject (e.g., employment), or country. 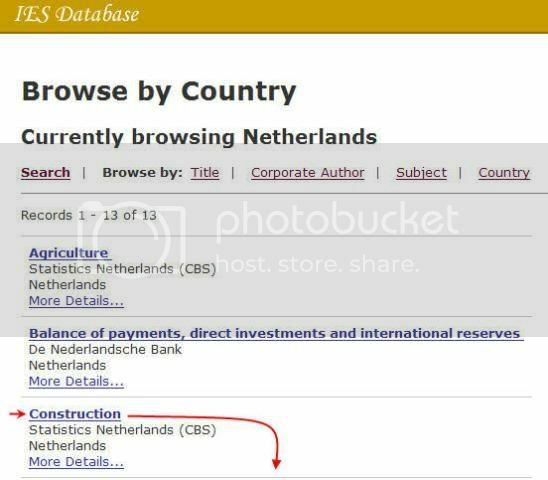 Users can search the database by keyword, country, author, and subject. The International Useful Links section on Liber8 highlights resources from the Fed, such as the Cleveland District’s Inflation Central with statistics and analysis on inflation for individual countries and world regions. It also links to a nicely focused list of reference information at other sites, such as a trade glossary from the Organization of American States and a portal to exchange rate information from the University of British Columbia. Similar sections for national and U.S. regional information provide helpful links as well. The national resources section of Liber8’s Current Economic Indicators category links to websites from the Fed and U.S. government agencies. These include FRASER, a product of the St. Louis librarians working in cooperation with their Research Division colleagues. FRASER stands for “The Federal Reserve Archival System for Economic Research.” FRASER consists of scanned historical and archival materials related to monetary policy or economic conditions. While not exactly current themselves, these materials provide the timeline and context for current statistical series. Publications in FRASER are from the Federal Reserve and U.S. government agencies, and include such titles as All Bank Statistics, 1896-1955 (Federal Reserve Board of Governors, 1959); Banking and Monetary Statistics, 1914-1941 (Federal Reserve Board of Governors, 1943) – the same from for 1941-1970, published in 1976; and Survey of Current Business, 1921-1999 (Commerce Department). The librarians at the St. Louis Bank aren’t the only ones working collaboratively to bring you valuable information. 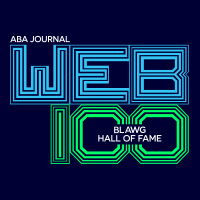 Even though each bank is an independent entity, librarians from each district and Washington have, since the 1960’s, been contributing to a shared index of research papers from economists throughout the Federal Reserve System. Called Fed in Print, the index is completely online now as are PDF copies of most of the papers. 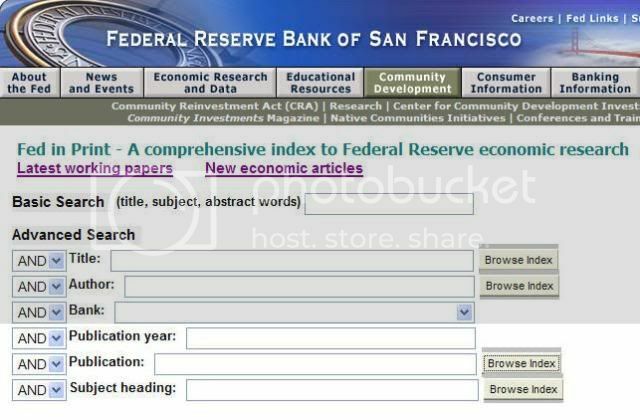 Updated monthly, the Fed In Print database has over 28,000 records and over 19,000 full text items. It is used internally by the Fed as well as by economists, researchers, and others all over the world. The St. Louis librarians are users, selecting items of general interest from Fed In Print to highlight in their Liber8 portal and Liber8 Newsletter. Searchers who have not explored the web resources of the Federal Reserve Bank of St. Louis will also want to get to know FRED and GeoFRED, two of the many databases they offer online. FRED is a huge, one-stop shop for U.S. economic time series data. GeoFRED is a web-based mapping application you can use to create custom U.S. maps based on the FRED data.